Antonio Petrov speaks to an audience about the UTSA Urban Future Lab. (Feb. 2, 2018) -- As San Antonio celebrates its 300th birthday, the city is sitting literally and figuratively “On the Edge of Future.” To help meet the needs of San Antonio’s growing population, an estimated 1.4 million residents over the next 25 years, UTSA has launched the Urban Future Lab. San Antonio’s sprawling landscape is a product of economic and logistic optimization. While San Antonians are optimistic about their future and becoming more directly involved in the processes of placemaking, questions remain about the future of transportation, civic infrastructure, social justice and affordable housing. 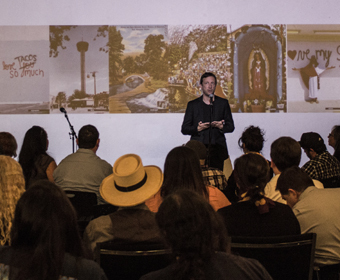 How does the community increase the scope of design in San Antonio and leverage the city’s rich social and cultural currencies to more directly engage in spatial production and economic development? How does it capture the emergent nature of urban transformations while recognizing San Antonio as a collective cultural artifact? To address these challenges and explore the rapidly changing dynamics of urban futures and how they relate to local economies and civic life, UTSA assistant professor Antonio Petrov has founded the Urban Future Lab. Housed within the UTSA College of Architecture, Construction and Planning, the interdisciplinary think-tank functions as a research and teaching laboratory and claims a leading role in determining the future of San Antonio’s built environment. The Urban Future Lab employs three guiding principles: Dialogue, Geography, Design-Citizen Agency and Public Interest Design. In conjunction with the Witte Museum’s upcoming Tricentennial exhibition, the Urban Future Lab and the Museum are jointly presenting a speaker series, titled On the Edge of Future: Narratives of the Making of a City, that explores urban transformation processes and asks how public interest design can have agency in the metamorphosis of a city in transition. In a sequence of events and exhibitions, UTSA and the Witte Museum aim to place dialogue into the center of their efforts; instrumentalize local, national, and international knowledge; and walk new territory as citizens and designers together in expanding the intellectual terrain. How are San Antonio and other cities, implementing transformations? What are the challenges? And how can members of the community preserve San Antonio’s core ethos while embracing change and progress? On the Edge of Future: Narratives of the Making of a City, a three-part series, continues with its second event, “Urban Transformations,” on Monday, Feb. 5, 2018 at 6 p.m. Speakers Iker Gil, director of MAS Studio, and Patty Heyda, associate professor at Washington University in St. Louis, will explore other cities that have undergone urban transformation. Gil will provide a comprehensive look at the history and transformation of Bilbao, discuss the role of the Guggenheim Museum and look to the future. Heyda, co-author of Rebuilding the American City, will discuss ways cities are mobilizing and transforming amid challenges. Darryl Byrd of ULTRAte will bring the presented perspectives into local contexts and moderate a discussion between the speakers and audience. The series concludes with its third dialogue, “Water,” at 6 p.m. on Monday, April 9, 2018. The discussion will examine the relationship between water and human geographies and how the synthesis was instrumental in the shaping of San Antonio. Learn more about UTSA’s new Urban Future Lab. Learn more about UTSA professor Antonio Petrov.